So, who will be bringing in the lovely tunes to swell the room and get our feet pumping? 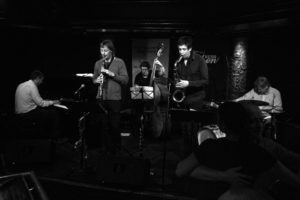 Jazzombies is David Skinner’s swing ensemble, with a lineup featuring some of the best swing musicians in Oslo. Jazzombies plays classic jazz tunes, by for example Benny Goodman, Fats Waller, Duke Ellington, Nat King Cole, and George Gershwin, as well as originals by David Skinner. The size of the group varies from a quintet to an octet. We play both Lindy and Balboa swing-dance events, mainly in collaboration with Bårdar Swing Club, as well as jazz clubs, festivals, and private engagements. The band prides itself on great tunes, interplay, dancer-friendly rhythmic variation, and huge reserves of swinging energy! 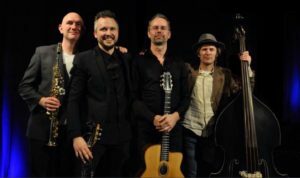 Oslo Stringswing Kollective (OSSK) consists of four musicians with a love for Django Reinhardt’s unique approach to the jazz. The members of the group regularly play in the atring swing birthplace of Paris where they sit in small intimate bistros surrounded by coffee, waffles and virtuoso string games. They wanted to bring this atmosphere back to Norway and thus, for now four years running, they have arranged an OSSK jam at Bar Django in Oslo, creating their own little Parisian atmosphere. The Local Boys offer String Swing with high temperature, drastic guitar handling and green chords. 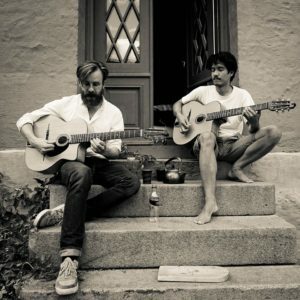 The band consists of Tor Ezaki (Oslo Swingers Club) and Lars Emil Dalin (Club Roulotte). They only use locally produced and sustainable bassists. The universe is vast. Everything in the universe is happening right now, at the same time. But you can only be in one place at a time, and your senses have limited range. Your life is a local experience of the universe. Why wonder what’s happening everywhere else, when your life is unfolding right here and now? The Local Boys recommend a local lifestyle. Time is an idea that exists in our mind. The clock is an invention designed to quantize time. Modern society is dancing to the beat of the clock. But your experience of life does not fit into a neat grid of time. As Albert Einstein said, «Put your hand on a hot stove for a minute, and it seems like an hour. Sit with a pretty girl for an hour, and it seems like a minute.» Life itself happens between the beats. In jazz music, we call it «Swing Feel». Come a little early, fine. Leave a little late, cool. The Local Boys suggest a «Swing Feel» mentality in life. There is no such thing as too much swing. Enjoy some handmade, local sound waves with The Local Boys.